In the third quarter the US was a global leader in equity returns. Strong GDP growth, tax cut stimulus, deregulation, employment gains and higher wages contributed to strong consumer confidence and spending. However, after recently meeting with CEOs and CFOs of over 50 companies we learned firsthand about negative headwinds weighing on earnings forecasts for 2019. Namely, a strong dollar hurting export demand, tariffs, higher oil, transportation, labor and interest costs, which all can negatively impact profit margins. China’s depreciating currency has posed additional challenges while emerging market currencies have reached multi-decade lows. The stocks of industrials, autos, chemicals, semiconductors and homebuilders have been discounting a global growth slowdown–possibly an earnings recession. Rising mortgage rates, loss of deductions in high-tax states and overheated markets are hampering high-end housing. Auto affordability has declined with high prices and tighter bank credit as most buyers make payments, although domestic truck sales are surging. With US oil companies solidly profitable at $50 a barrel, fundamentals support lower fuel inputs as commodities will tend to trade close to the cost of production over time. For the past decade momentum strategies continued to outpace those based on price, value and buying at a discount to intrinsic value. That may be changing. Overpaying and overborrowing are recurring investment sins that tend to destroy intrinsic value over time. General Electric is a good example of a company that mispriced long term care policies, and grossly overpaid for energy assets. A $10,000 investment in GE in July of 1999 when GE was one of the most popular and highly valued companies in the world is now worth less than $6,300. When money is free and easy it is common to pay for “growth at any price.” Rising interest rates are starting to expose the misallocation of capital while flushing out excesses. Money losing speculations are suffering. Bitcoin has corrected over 75% from its speculative high earlier this year (source Standard & Poor’s.) 83% of initial public offerings (IPOs) are losing money (WSJ) while the cash burn1 of the top 200 private Silicon Valley startups is 5-10 times worse than at the peak of the tech mania in 2000 (source Benchmark Capital.) Do we really need 130 food delivery companies? Wall Street tends to ignore signs of excess supply which often follows exuberance in an industry doing well. Overall supply of publicly traded stocks in the US continues to decline as stock buybacks in the US is expected to reach $1 trillion in 2018 according to Goldman Sachs. This demand is favorable, although ultimately rising revenues and cash flows are the critical metric in building underlying intrinsic values. Global mergers exceeded $2.5 trillion in the first half of 2018, up 61% over the prior year. Mergers for the full year 2018 are on pace to exceed $5 trillion (source Thomson Reuters.) According to KPMG over half of mergers negatively impact shareholder value. Historically, a financial crisis usually follows a rapid buildup of debt. We are witnessing steep corrections in countries where economic policies are poor and where there has been excessive borrowing, especially in dollar denominated debt. Turkey, Argentina, Italy and China are a few examples of countries that have been struggling with deteriorating balance sheets. Excess borrowings can create a risky situation for companies perceived to be conservative. AT&T has accumulated a massive $250 billion in liabilities. Leverage loans seem to be the preferred method for funding speculative grade companies and excesses continue to build with the proliferation of covenant-lite loans. That market now is larger than the high yield bond market. The price to EBITDA (earnings before interest, taxes, depreciation and amortization) paid for acquisitions between 2007-2015 averaged nine times. The past two years that price has jumped to 15 times EBITDA, reflecting increased risk from higher acquisition costs. It is vitally important to know the status of individual balance sheets. Higher interest rates and the withdrawal of liquidity should help to normalize volatility in the stock markets where the average NYSE stock has typically fluctuated 50% a year. 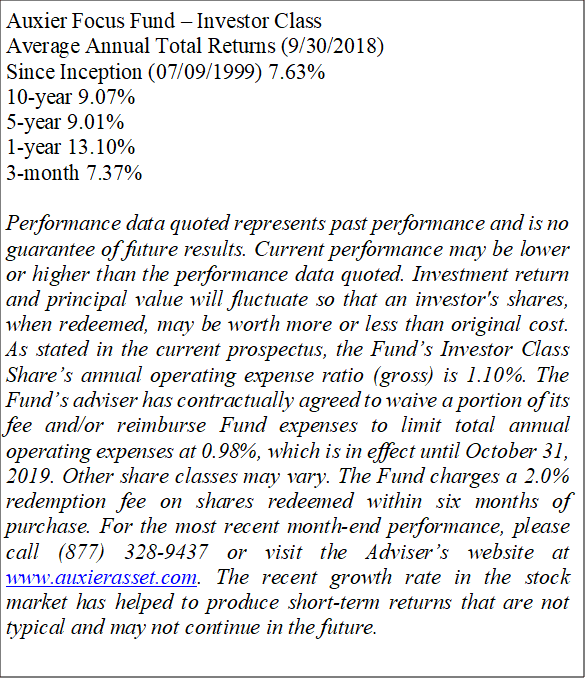 Auxier Focus Fund’s Investor Class returned 7.37% in the third quarter vs. 7.71% for the S&P 500 Index. The stocks in the Fund returned over 8.3%. Domestic stocks comprised 80%, foreign 15%, with cash and “workouts” 5%. 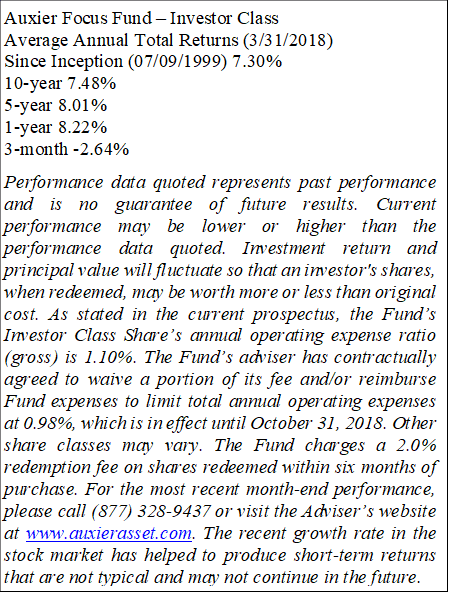 From inception at the top of the market in 1999 to September 30, 2018, a hypothetical $10,000 investment in the Fund has grown to $41,111 with an average equity exposure of 80%. This compares favorably to $30,027 for the fully invested S&P 500. Healthcare names, from health insurers, pharmaceuticals and biotech were strong recent performers in the Fund. Many were purchased at attractive prices in the teeth of negative headlines over the past two years. 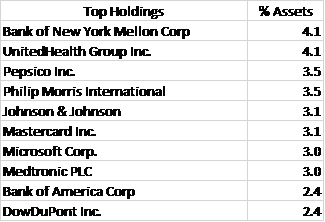 Contributors to the quarter: our outlook on a cross section of portfolio positions with a positive return for the quarter ended 9/30/2018. Cigna is acquiring pharmacy benefit manager Express Scripts for an estimated $67B or over $95 a share. The deal includes $48.75 in cash and 0.2434 shares of Cigna for each share of Express Scripts and is expected to close by the end of the year. We originally invested in ESRX at $7.63 a share after a face-to-face meeting with management late on a Friday. Abbott is a leader in nutrition, diagnostics, pharmaceuticals and medical devices. One of their new devices, MitraClip, did better than expected on the Cardiovascular Outcomes Assessment of the MitraClip Percutaneous Therapy leading to high expectations for the future of the device. The introduction of the FreeStyle Libre blood glucose monitor is an exceptional new innovative product. Biogen is a market leader in the treatment of Multiple Sclerosis (MS) and Spinal Muscular Atrophy (SMA). In addition to their current treatments, Biogen has been heavily investing in research into Alzheimer’s drugs with two drugs, Aducanumab and E2609, currently in phase three trials. According to analytics company GlobalData, the Alzheimer’s market is expected to grow to over $15 billion over the next decade. Biogen’s free cash flow for 2018 appears likely to exceed $4 billion. According to AARP, 10,000 baby boomers in the US turn 65 every single day. The demographics for Zimmer Biomet medical devices are improving. Zimmer Biomet is a leader in hip, shoulder, elbow and knee replacements as well as producing vital devices for heart and spinal surgery. Their free cash flow is over $1 billion annually. Merck’s signature drug, Keytruda, is an immunotherapy that is currently approved to treat seven types of cancer. Keytruda works by blocking the PD-1 pathway that cancerous cells use to hide from the body’s T cells and then letting the patient’s own immune system destroy the cancer. Keytruda was recently approved in China for adults with unrespectable or metastatic melanoma. In addition to Keytruda, Merck has a strong pipeline that includes nineteen drugs in phase 3 trials and three drugs that have already passed phase 3 trials and are awaiting FDA approval. Microsoft has been very successful in their transition into the new age of computers. Personal computing now only makes up 33% of their revenue and that includes their Xbox, Surface and advertising revenues. LinkedIn now has over 575 million users while Office 365 reaches over two billion first-line users. Microsoft Azure, growing over 70%, is a cloud product that is not in direct competition with its customers. The company has over $130 billion in cash and short-term assets. Hoping to take advantage of the rapidly growing medical sector, Medtronic has focused on four high growth areas: Cardiac and Vascular, Restorative Therapies, Minimally Invasive Therapies, and Diabetes. The diabetes group has seen particularly strong growth from the MiniMed 670G featuring Smartguard, which is the world’s first hybrid closed loop insulin system. The Tax Cuts and Jobs Act freed up over 40% of their cash helping them towards their goal of returning 50% of free cash flow to shareholders. The maker of Gorilla Glass, Corning has enjoyed a rebound period with the introduction of the new iPhones and surging demand in the automotive sector. Gorilla Glass is a durable, light, scratch-resistant glass that is in high demand in smartphones, tablets and laptops. As automobile companies look to add touch screens in their new cars, the demand for Gorilla Glass looks solid. 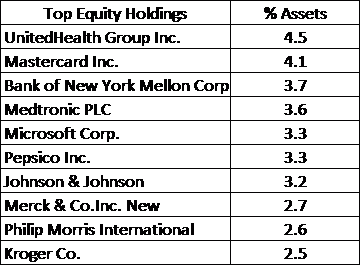 Detractors to the quarter: our outlook on a cross section of portfolio positions with a negative return for the quarter ended 9/30/2018. Despite missing top line expectations, Quest Diagnostics has established a close partnership with UnitedHealth. They are now the in-network lab for all of UnitedHealthcare’s 48 million patients as well as collaborating with UnitedHealth on a variety of programs designed to increase standard of care while reducing costs. Based in Idaho, Lamb Weston is a leader in the frozen vegetable industry with a focus on potatoes. They saw a significant boost in earnings per share from the Tax Cuts and Jobs Act as well as rapidly increasing sales after their spin-off from Conagra Brands in November of 2016. Under the leadership of Charles Scharf, BK is investing heavily to improve operating platforms and their technology infrastructure while working to keep their costs down across the rest of the company. Mr. Scharf had great success using the same formula at Visa. Higher interest rates should also enhance earnings power as the company is a huge generator of free cash. 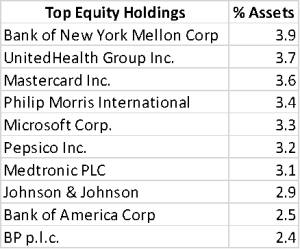 We see good value in the banks both large and small, with many selling at price earnings ratios of 10-11 times 2019 earnings estimates. Cognizant is one of the world’s top regarded IT firms with operations all over the world. Management is excited about the possible program servicing opportunities that come with growing Medicare and Medicaid. They are a leader in connecting companies to the cloud. With most of their holdings in Hawaii, Central Pacific has recently suffered from the unusual hurricane season in the Hawaiian archipelago. Despite the strange hurricane season, total deposits increased year over year to $4.98 billion while core deposits also increased to over $4 billion. On September 27th, Central Pacific announced that Paul Yonamine would take over for Catherine Ngo as president and CEO effective October 1st. John Dean has done an exceptional job turning around this franchise. Manitex International was helped in their deleveraging efforts by Tadano buying 14.9% of their shares in May of this year. After seeing steady growth in market share in straight-mast cranes over the last five years, Manitex management is excited about the opportunities for knuckle boom cranes where their current market share is under 5%. After meeting management a little over a year ago we were very impressed with their plans to turn the business around. Molson Coors is working to reduce costs and diversifying their brand as consumer demand has shifted away from macro beer brands. In addition to investing in spiked seltzer, iced coffee, kombucha, non-alcoholic beer and craft beer Molson Coors has been testing non-alcoholic cannabis infused teas, seltzers and beers. Recreational marijuana became legal across Canada on October 1st and is currently legal in nine US states covering over a quarter of the US population. Coors has been in business since 1873. Franklin Resources has had several quarters of negative growth in operating revenues, net income, and assets under management as they work to improve their company. Management at Franklin Resources is focused on reducing risk and augmenting their investment capabilities. 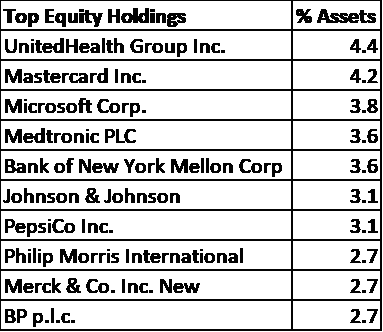 Their earnings per share have not decreased as much as the rest of their financials due to management’s aggressive share buyback program. Over half the companies market capitalization is in cash. The Johnson family has run the company since 1947. We strive to invest carefully in well-researched businesses that have enduring products or services with the historical ability to survive and thrive in the most stressful market and economic downturns. We see meaningful advantages to our size, cumulative knowledge and experience negotiating severe market declines. We don’t pay steep premiums, sometimes referred to as control premiums2, like private equity firms who are attempting to gain a controlling interest and have a wide mandate with flexibility to try to protect in down markets. We have major “skin in the game.” It was the “other people’s money” syndrome that contributed to the last financial downturn. The true cost in investing is the lack of knowledge in what you own. The big advantage to buying pieces of businesses in the auction markets is the emotion, volatility and liquidity that can contribute to bouts of irrational behavior and unprecedented bargains when compared to private markets. Panic may be a profitable backdrop for investing whereas euphoria may be disastrous. The proliferation of exchange traded funds (ETFs) and mathematical algorithms have further enhanced volatility. We generally know ahead of time–usually after years of research–what we want to own, and welcome negative headlines to provide the best entry point. In the past many attractive purchase prices below intrinsic value, combined with quality operating performance, lead to the double-triple play investment return over time while deferring tax bites. There are so many forces at work to separate you from your hard-earned savings. Without cumulative knowledge and the right temperament, the risks to compounding returns can be very high. 2 Control premium is an amount paid to gain enough ownership interest to control a corporation or other entity. This would typically be an amount in excess of the simple fair market value of the shares sought to be purchased. In the second quarter, the US enjoyed improving fundamentals in terms of GDP1, employment, service sector and manufacturing gains. Home equity continues to increase, hitting records. Rising interest rates are pressuring bonds, bond surrogates and businesses with poor balance sheets. Lower taxes and regulation rollbacks are being offset somewhat over the worries of escalating trade tensions. The tax act expensing allowance is stimulating capital spending which in turn should improve overall productivity. While earnings in general are rising so are input costs like labor, fuel and transportation. Tariffs are leading to steep price increases in goods like steel and lumber. There continues to be a growing and acute shortage of truckers with a projected shortfall of over 50,000 drivers. We are seeing rolling industry corrections with increased volatility, in part due to tightened liquidity and the concentration of high frequency exchange-traded funds (ETFs). Higher interest rates and a strong US dollar have led to a sharp correction in emerging market currencies where low rates have led to a borrowing binge the last few years. Higher rates expose bad behavior and poor investment decisions. 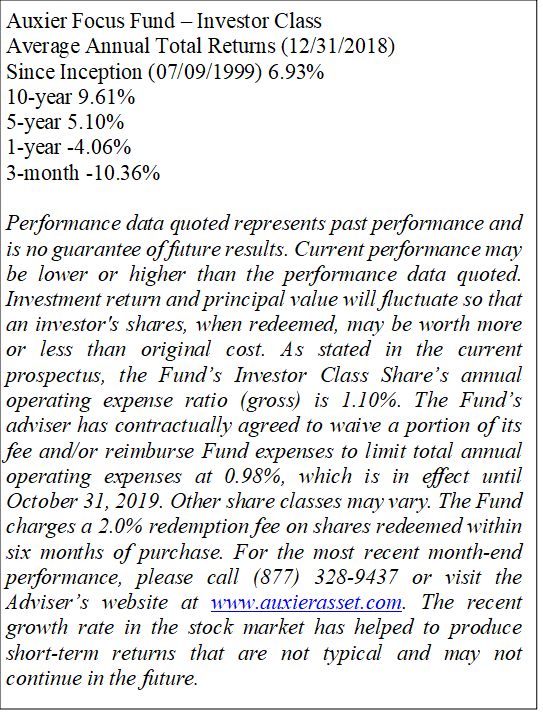 Auxier Focus Fund’s Investor Class returned 2.39% in the second quarter vs. 3.43% for the S&P 500 Index. The stocks in the Fund returned 3%. Domestic stocks comprised 81% and foreign 15%, with cash and “workouts” 4%. From inception at the top of the market in 1999 to June 30, 2018, a hypothetical $10,000 investment in the Fund has grown to $38,289, with an average equity exposure of 78% compared to $27,878 for the fully invested S&P 500. When we started the Fund, General Electric was one of the most highly valued and popular companies in the world. $10,000 invested in General Electric back then is worth less than $6,500 as of June 30. Buy, hold and forget, without aggressive research, can be costly. Revenues for the quarter grew 13.3% to $55.2 billion. Earnings from operations increased 18.8% to $4.1 billion. Every business segment reported double-digit earnings growth. Cash flows from operations for the quarter were $8.37 billion, up 29.63%. UnitedHealth repurchased 11.6 million shares for $2.65 billion during the first quarter. They also paid $722 million in dividends, an increase of 21.1%. UnitedHealth ended its exclusivity deal with Lab Corp this quarter and added Quest Diagnostics as one of its diagnostic service providers. This will provide their customers with more diverse diagnostic options in the future. Valero saw revenues of $26.44 billion during the quarter, up 21.44%. EPS2 was $1.09, up 60.29%. Net income for the quarter was $469 million, up 112.79%. Net cash flow from operating activities was $138 million, down 86.03%. The decrease in cash flow was due largely in part to the company’s continued investments in the future growth of the business. Capital investment plans for 2018 remain at $2.7 billion. $1 billion of this amount is for growth projects and the remaining $1.7 billion is for sustaining the business. Continued increase in US oil production and the decision to increase OPEC3 production by 1 million barrels per day will increase Valero’s earning potential. Growth prospects for Valero include renewable energy ventures such as a wind farm in Texas and a renewable diesel plant in Louisiana that will produce 10,000 barrels per day. Valero plans to increase production in this plant by 70% by the end of 2018. Total operating revenues in the most recent quarter remained flat at $22.3 billion. The total operating margin increased by 130 basis points to 8.4%. Net income for the quarter increased by 30% to $1.31 billion. The increase in net income was driven by improved cost management and a lower tax rate. Anthem paid dividends of $0.75 per share in both Q1 and Q2 which equates to an annual dividend of $3.00 per share. Revenues for the quarter were up 3.7% to $1.88 billion. This marks 16 consecutive quarters of revenue growth. Quest realized $180 million in tax savings and will use $75 million of this to reinvest into and grow the business. Quest’s new partnership with UnitedHealth Group provides an avenue for continued growth as they saw a net increase of 28 million lives available to them due to the partnership. Quest’s annual savings from its cost savings program ‘Invigorate’ were $1.3 billion, and they expect these savings to continue into next year. Currently working with multiple partners on a data management program that will utilize blockchain technology to increase data security as well as decrease costs. Becton Dickinson saw strong revenue growth in all three of their main segments leading to overall revenue growth of 47.2%. The continuing integration of Bard is going faster than expected. Cigna is acquiring Express Scripts for $48.75 in cash and 0.2434 of Cigna stock per share, which is over $90 a share. The deal is expected to close by the end of 2018. Kroger has focused on staying ahead of competitors as it adds three automatic warehouses for grocery delivery via robots this year. Their investments prove worthwhile, as their digital sales grew by 66% last quarter. In the next few years they expect their warehouse number to reach 20 and to benefit from their recently announced partnership with Nuro, an autonomous driving company. In terms of products, Kroger’s Simple Truth brand has reached $2 billion in annual sales, helping drive their adjusted net earnings up 14%. Merck beat estimates in the second quarter of 2018 with $10.5 billion in revenues and EPS of $1.06. They were buoyed in the quarter by their signature cancer drug KEYTRUDA which allows the body’s immune system to destroy cancerous cells by blocking a protective enzyme in cancer cells. Sales grew 89% in the quarter to $1.667 billion and are expected to continue to grow to upwards of $13 billion annually by 2026. Recently KEYTRUDA was approved in China and the EU for metastatic melanoma. Both transaction numbers and gross dollar volume were up for Mastercard, with net revenue rising 27% this past quarter to $3.6 billion. They have exemplified a strong push for growth in emerging markets with the recent acquisition of Oltio, which resides in South Africa. Acquiring Oltio enables Mastercard to introduce digital payments to even the smallest of local businesses to accelerate growth. In addition, their VocaLink subsidiary continues to drive their “Other Revenues” category, which was up 33% via its real time payments. As cash still makes up 80% of world’s total transactions, many believe Mastercard has plenty of room to grow even as an established company. Biogen saw revenues increase by 9% to $3.4 billion. Revenue growth was driven by Spinal Muscular Atrophy drug Spinraza which saw a 108% increase in revenue. Spinraza is Biogen’s fastest growing drug which they hope will be able to offset the slowing Multiple Sclerosis product line. Biogen presented the detailed results for the phase II trials of their Alzheimer’s drug BAN2401 on July 25th. The results of the trial were positive with tested patients showing 30% less cognitive decline over 18 months than those who received the placebo, but the presentation garnered a mixed reception and caused Biogen’s stock to fall 9% in after-hours trading. Earlier in July, Biogen announced that the trials of the drug were looking very positive without giving any details, and this announcement may have caused many to anticipate that the results would be better than what was ultimately shown. Currently, Biogen’s stock is hurting from the results announcement, but their outlook is still positive in the long-run due to the strength of their pipeline. Another Alzheimer’s drug in Biogen’s pipeline, Aducanumab, just finished its enrollment for two phase III trials. This drug has been regarded as more promising than BAN2401, and if it is successful Biogen will have the only drug in a $12 billion market. Twenty-First Century Fox has been in the news recently due to the bidding war between Disney and Comcast. The merger that was eventually approved by shareholders, between Disney and Twenty-First Century Fox, will give Twenty-First Century Fox shareholders $38 a share or stock consideration. The collar on the stock consideration gives Twenty-First Century Fox shareholders an exchange ratio of 0.3324 if Disney stock is above $114.32. At the current price of $115.62 a share, the value on the consideration is about $38.50 a share. In addition to the deal with Disney, Twenty-First Century Fox will spin-off their news, sports, and broadcast businesses to create a new “Fox”. The new “Fox” will include Fox News Channel, Fox Business Network, Fox Broadcasting Company, Fox Sports, Fox Television Stations Group, and sports cable networks. The deal has already been approved by the DOJ4 but still awaits approval in foreign markets. One of only 22 companies to increase dividends every year for at least 50 consecutive years, Johnson & Johnson increased total sales in the first quarter 12.6% to over $20 billion. As the world’s largest medical conglomerate, they are well positioned to provide medicine and care for aging Baby Boomers. Travelers is coming back down from historic highs early this year. Last quarter they posted revenue gains of 5% and net income gains of 12%. Hurricane losses in 2017 exceeded $200 billion. In 2018 losses have continued to be severe in hail and fires. This could further reduce capacity which should benefit premium pricing. Both stocks are starting to move higher after Q2 results came out for PM. Shipments on their “reduced risk products” were up, boosting their revenue. With the ability to raise prices, popularity of vaping and their inevitable entry into the marijuana market (anticipated to be a $50 billion market by 2026), the long-term fundamentals look solid. Both companies are structured to take advantage of developing trends. Coors stock has struggled with 10% tariffs on aluminum, increasing competition from micro-breweries and a roaring marijuana market cutting into the overall beer market. Trying to take advantage of this growing market, Coors has assembled a team in Canada to find a way to best tap into the cannabis industry. The US employment-cost index, which measures wages and benefits, rose 2.8% in the twelve months ended in June. According to Standard and Poor’s, strong employment gains could lead to a further drop in the unemployment rate, to 3.6% over the next few months. Historically, in a more normalized interest rate environment, the 10-year Treasury would yield 2% higher than the prevailing inflation rate. This makes bonds vulnerable with the current rate under 3%. Through six months the Barclays intermediate bond index has declined 2.63%. Higher inflation rates tend to compress stock price-earnings ratios making high expectation momentum strategies vulnerable to sharp corrections on earnings disappointments. One of the best inflation hedges I have seen in the past thirty-five years is a well nurtured business, with disciplined capital allocation, that earns high returns on capital, enjoys rapid inventory turns and has the ability to raise prices while requiring little in mandatory capital expenditure to grow. We strive to be long term owners of such enterprises. Conversely, utilities have high mandatory cash needs and can suffer if faced with large construction projects. In the 1980s I remember watching utilities get crushed in the market as higher inflation led to cost overruns on the construction of nuclear power plants. In our research we have not been able to identify one utility in the US that currently has positive cash flow. In socialist Venezuela, inflation rates are running more than 40,000%, yet stock returns in local terms have still exceeded inflation. Bonds have been wiped out. There is a misperception that government bonds are safe. Argentina has defaulted over six times and recently raised interest rates 40% to defend their currency. Technological disruption is a constant threat as the economy digitizes. Platform changes need to be scrutinized. The move from 3G to 4G decimated phone companies like Nokia, Blackberry and Motorola leading to a duopoly with Android and Apple. 5G could be as equally disruptive. Voice enabled assistants, artificial intelligence and augmented reality are potential platforms that could change the status quo. The growth of the cloud has led to centralized market power with Amazon, Microsoft and Google. However, blockchain technology decentralizes the internet through digital ledgers and could prove to be a powerful disrupter that claims to be less corruptible. The popularity and performance of many technology stocks is acting as a magnet for enormous flows of capital which can lead to supply gluts. We are seeing exuberance in venture funding from Japan, China and Silicon Valley. This happened in the late 1990s when the rage was internet hosting and fiberoptic. Massive capacity was built for businesses losing money and when interest rates rose a crash followed. Telecom companies like Lucent and Level 3 lost over 85% of their value. It is estimated by the venture firm Benchmark that today the top 200 Silicon Valley start-ups have cash burn rates 5 to 10 times 1999 levels. The potential problem, like 1999, is that much of the technology infrastructure is being built for businesses losing money and with interest rates rising the funding can cease abruptly. Softbank is driving crazy valuations in businesses like WeWork, which provides basic workspaces. Softbank is seeking a valuation in excess of $20 billion for this company that lost over $900 million last year. Many venture firms will often set private market pricing far higher than underlying fundamentals warrant. In addition, record amounts of money have been raised in private equity (leveraged buyouts). Carlyle Group recently raised a record $18.5 billion. Many of our portfolio companies are attractive to these leveraged buyout firms because of their high free cash flow characteristics. However, bond protection via debt covenants has never been this poor. This is a new cyclical low in the quality of covenant protection, which is common near the end of booms. We are seeing exciting innovations in medtech and biotech. Many of the larger companies’ stocks trade at very reasonable valuations by historic standards. Fred Hutchinson Cancer Research Center out of Seattle has stated cures for cancer are in sight as “immunotherapies” that unleash the body’s own immune system to seek out and destroy cancer cells have “shown mind-blowing results in early testing on blood cancers.” CAR T cell therapies are being developed by companies like Celgene and Gilead. Merck’s KEYTRUDA has shown good potential for the treatment of lung cancer. Companies like Alkermes, led by founder CEO Richard Pops, are at the forefront in the treatment of opioid addictions, which have led to over 50 million deaths this past year. Exciting strides are being made in transaortic valve replacement led by Medtronic. Cerner is an attractive leader in digitizing hospitals and doctors’ offices. They recently landed a major multiyear contract with the Veteran’s Administration. Alphabet is taking a leadership in artificial intelligence and predictive data analytics. YouTube, with over 1.8 billion users has grown over 20% this past year and has an annual growth rate nearly twice as fast as Facebook’s. YouTube users spend over an hour a day on the YouTube mobile app alone. Waymo is a leader in self-driving car technology. It took Waymo six years to test their first one million miles, this year they went from seven to eight million in one month. In the industrial sector, fears over deepening trade wars have led to more attractive prices for quality franchises like Parker Hannifin and Caterpillar. Higher short-term interest rates will help earnings for companies and households with high cash balances which have suffered under central bank interest rate suppression over the past decade. We are looking for management teams focused on using predictive data analytics and the “customer experience.” Those on the right side of digital are being rewarded with premium valuations. With internet transparency, high-grade ethics are more important than ever in building intrinsic value. We strongly believe that the best way to enjoy high compounded returns over long periods is through the well-researched selection of high return businesses that are ideally founder or family controlled and where the management is diligent in capital allocation and relentlessly focused on improving value. Usually the best buys have been when there is a plethora of negative headlines and the consensus is “this is no time to buy stocks.” Those purchased at an attractive price can reward investors with the double-triple play over years while deferring taxes and providing more than adequate compensation for the risk taken. It appears the Trump administration is using tariffs as a tool to bring countries to the negotiating table on a more bilateral basis. Negotiations surrounding Europe and The North American Free Trade Agreement (NAFTA) appear to be moving forward. China is tougher. What is needed is a united front by allies to increase the leverage for a level playing field respecting intellectual property rights. We see President Trump as resolute with China. On the downside, the Smoot-Hawley Tariff Act of 1930 raised tariffs on over 20,000 imported goods which led to a drop of American exports and imports by over half. So free trade is the obvious choice vs protectionism. Given China’s growing debt load, nearly 300% of GDP, steep stock market correction and surplus trade position, it looks like a good time for the US and Europe to push for meaningful reforms. We are hopeful that this is a bargaining stance to ultimately lead to lower overall global tariffs. While there is immediate pain in the farm sector, negative headlines create opportunities to add to world class business franchises that rarely trade at bargain prices. China has been a big creditor to Venezuela where the Maduro policies have led to starvation, human rights atrocities and hyperinflation. The “Black Book on Communism” published by Harvard University Press in France illustrated work carried out by a team of professors and researchers from the National Center for Scientific Research—the most important scientific institution in France. They listed the number of people killed by communism. China led the list with an estimated 82 million dead under communist rule. Since 1999 Venezuela, where the leadership follows Marxism-Leninism, they figure more than 252,000 dead. That is why we put so much time into daily research to identify facts and fundamentals and those policies that can destroy intrinsic value. Integrity in financial markets, political checks and the rule of law are all critical to enduring long term. The only constant in investing is change and the key to risk management continues to be a rational approach rooted in a daily tenacious research effort. I sought for the greatness and genius of America in her commodious harbors and her ample rivers—and it was not there…. in her fertile fields and boundless forests—and it was not there…. in her rich mines and her vast world commerce—and it was not there…. in her democratic Congress and her matchless Constitution—and it was not there. Not until I went into the churches of America and heard her pulpits flame with righteousness did I understand the secret of her genius and power. America is great because she is good, and if America ever ceases to be good, she will cease to be great. – Alexis de Tocqueville. 1 Gross Domestic Product (GDP) is the monetary value of all the finished goods and services produced within a country’s borders in a specific time period. 2 Earnings per share (EPS) is the portion of a company’s profit allocated to each outstanding share of common stock. Earnings per share serves as an indicator of a company’s profitability. EPS is calculated as: EPS = (Net Income – Dividends on Preferred Stock) / Average Outstanding Shares. 3 OPEC is an abbreviation for Organization of Petroleum Exporting Countries, which is a union of oil producing countries that regulate the amount of oil each country is able to produce. 4 DOJ is an abbreviation for The Department of Justice, a department of the federal executive branch, headed by the attorney general, which administers the Federal Bureau of Investigation (FBI), prosecutes violations of federal law, and is responsible for enforcing all civil rights legislation. The first quarter of 2018 brought back more normal volatility which has been rare in this recent era of artificially low interest rates. We are seeing a long overdue, much needed correction to help purge excesses in the global markets. Speculation has been boiling in the cryptocurrencies, along with pre-public technology stocks and can also be seen with record margin debt used to buy stocks. The excitement in January over lower tax rates, deregulation and strong corporate earnings has been replaced with concerns of higher commodity prices (oil up over 30%), wage pressures, transportation costs and rising interest rates which can threaten profit margins. Aggressive trade rhetoric between the US and China has fueled fears of global trade wars. With the growth of online shipping and driver regulation, there is a meaningful shortage in both trucks and truck drivers leading to an unprecedented rise in logistics costs often climbing over 20% this past year. Amazon’s recent shipping costs are up over 35%. Housing prices are still showing gains in excess of 6% year over year, driven in part by a strong job market and millennial demand which now exceeds baby boomer demand. Housing inventory is down 12% this past year. Seattle has seen housing prices appreciate 45% the past three years (Zillow). Higher inflation and interest rates tend to compress price-to-earnings ratios making high expectation, highly valued companies vulnerable to steep declines as there tends to be a reversion to the mean. We are currently amidst the longest stretch in history where growth has outperformed value. Price and value have taken a back seat to momentum and the rate of change in earnings and sales. However, according to the Wall Street Journal, from 1926 through the end of 2017 value outearned growth stocks by an average of 3.1 percentage points annually. Higher interest rates in time tend to alter behavior and punish the “buy at any price mentality,” especially stocks sporting exciting stories that lack healthy cash flows. Digital disruption and the “Amazon effect” have negatively impacted share prices in numerous industries like grocers, media, healthcare, and logistics companies like FedEx, creating selective opportunities resulting from material misappraisals. The massive inflows to pooled vehicles with little transparency and “skin in the game” has increased the risk of emotional and irrational behavior via the “electronic herd.” It is easy to sell when you don’t know what you own. Much like the 2008 crash, where bundles of low-quality mortgages were all the rage, compiling a group of overpriced stocks may have the same effect on those investing in pools based on upward momentum without adequate due diligence. We believe we are entering a time where cumulative knowledge of managements, business models and the supply/demand characteristics of industries is critical to mitigate risk. Auxier Focus Fund’s Investor Class declined 2.64% in the first quarter vs. a decline of 0.76% for the S&P 500 Index. Domestic stocks comprised 78% and foreign 15%, with cash and “workouts” 7%. Since inception at the top of the market in 1999, a hypothetical $10,000 investment in the Fund has grown to $37,394, with an average equity exposure of 78% compared to $26,952 for the fully invested S&P 500. Bonds as measured by the Bloomberg Barclays US Aggregate Bond Index declined 1.5%. The STOXX® Europe 600 declined 4%, and the FTSE 100 declined 8.2%. 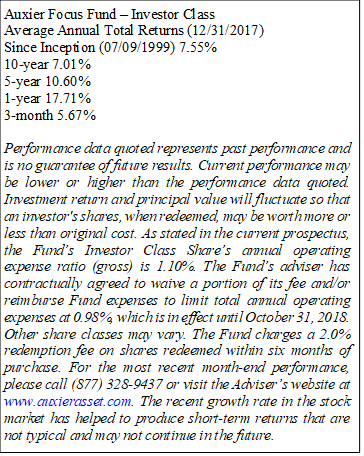 The foreign component detracted from Fund performance for the quarter. Mastercard ended their fiscal year with fourth quarter sales up 20% to $3.31B benefiting from strong holiday spending. The continued focus on international growth opportunities has paid off as there are now three times as many cards outstanding worldwide than in US markets. Vocalink, a payment system headquartered in the UK, and Oltio, a mobile payments and banking technology company out of South Africa, along with other acquisitions contributed 3% to overall sales growth in the quarter. Microsoft Corporation’s focus and investment in their Intelligent Cloud continues to be beneficial with overall segment revenue growth of 15% to $7.8B. This was driven by Azure revenue growth of 98% with computer usage more than doubling year over year. Adjusting for the $13.8B net charge related to the Tax Cuts and Jobs Act, net income grew 20% in the quarter to $7.5B. Management has done an excellent job transforming the company to the cloud over the past three years. At the end of 2017, Bank of America had total loans and leases of $936B and total deposits of $1.3T. Given the large low-cost deposit base there is considerable positive leverage in a rising interest rate environment. With around two-thirds of the wireless and broadband market controlled, the largest wireless carrier in Latin America is executing well. Industry growth is resulting from growing mobile data usage and low market penetration. AMX has a strong competitive position with family ownership, high returns on invested capital, a strong balance sheet and scale. The defense contractor’s stock spiked up this quarter due to increased defense spending set by the Trump administration. International sales, which account for 30% of revenue, are expected to increase due to greater political instability. Raytheon’s backlogs remain robust, although we worry that margins are peaking. Visa has a strong business model that is continuing to perform well. They are global leaders in electronic payments with their market share of digital transactions accounting for around 58% worldwide. Visa produced over $8 billion in free cash flow in 2017, has been growing earnings at a double-digit pace, and has great room to increase their dividend. Despite beating Wall Street’s fourth quarter earnings and revenue expectations, Johnson & Johnson lost investor confidence on a projected 2018 operational revenue growth of 3.5% to 4.5%. J&J’s $30B acquisition of Actelion last summer contributed 4.2% towards their Worldwide Pharmaceutical sales growth of 8.4% to $36.3B in the quarter. Although DowDuPont recorded a $1.1B benefit from the Tax Act, restructuring and goodwill impairment items of $3.11B led to a reported pro forma loss of $1.21B, or loss of $0.52 per share, in the quarter. The plan to split into three different companies post-merger was originally anticipated to take up to two years but is now expected to take between 12 and 14 months. DowDuPont also increased its expected annual cost savings by 10% to $3.3B. We really like the Chief Executive Edward Breen who has an exceptional capital allocation record and will oversee the split up of the company. Low natural gas inputs continue to be a material benefit to chemical producers. On February 15, 2018, Merck discontinued a phase 3 trial of their BACE1 inhibitor, verubecestat, adding the potential Alzheimer’s treatment to a growing list of clinical failures from pharmaceutical companies. This shook investor confidence in Biogen who also has a BACE1 inhibitor currently in late-stage testing. However, Biogen’s leading Alzheimer’s candidate, aducanumab, takes a different approach than BACE1 inhibitors by reducing amyloid plaques in the brain vs. preventing the build-up. Biogen’s expansion by 510 patients in aducanumab’s late-stage study to confront the high variability in the primary endpoint has increased fears of another industry failure. With earnings over $22 this year the stock seems very cheap. The North American beverage unit has struggled but management is focusing on fixing the problem with innovative new offerings. Beverage companies in general have fallen out of favor in the market and lower prices could provide an attractive entry level for long-term investors. On January 22, 2018, Sanofi announced the acquisition of Bioverativ for $105 per share in cash, a 64% premium to their previous closing price. The cost basis in the Fund was $41.14. Bioverativ is the hemophilia business unit that was spun-off from Biogen in 2017. Sanofi completed the $11.6B takeover at the beginning of March adding Bioverativ’s two hemophilia extended half-life therapies, Eloctate and Aprolix, which represented the first major treatment advancements in almost 20 years when launched in 2016. While most acquisitions destroy value, we like to see spinoffs as they generally energize management teams and enhance intrinsic value. On January 29, 2018, Dr. Pepper Snapple Group and Keurig Green Mountain Inc. entered into a definitive merger agreement to create Keurig Dr. Pepper (KDP) for $123 a share. The Fund’s cost is $15.23. We bought Dr. Pepper shortly after it was spun out of Cadbury Schweppes for less than ten times earnings. We discovered a highly focused and competent management team. The two companies will bring iconic brands such as 7 Up, A&W, Mott’s and Sunkist together with Green Mountain Coffee Roasters, Keurig’s single serve coffee system, and more than 75 owned, licensed, and partner brands. Dr. Pepper Snapple shareholders will receive $103.75 per share, or $18.7B, in a special cash dividend and retain 13% of the combined company. KDP is targeting $600M in synergies on an annualized basis by 2021 and a dividend of $0.60 per share at the close of the transition. Total net debt is expected to be approximately $16.6B with a target net debt/EBIDTA ratio below 3.0x within two to three years after closing. KDP will have combined proforma 2017 annual revenues of approximately $11B. This is another example of private equity firms buying our high free cash flow generating businesses–which has been a common occurrence in our portfolio over the years. Private equity firms have close to one trillion dollars in buying power and could be a material source for mergers, especially as prices correct and become more enticing. On March 8, 2018, Cigna entered into a definitive agreement to acquire Express Scripts Holding Company for $67B, or $92 per share. This buyout would broaden the portfolio of Cigna’s specialty services and boost their focus on advanced analytics. Combining the companies’ strengths will allow them to use a patient’s medical history to improve treatments and lower costs while simplifying the healthcare supply chain. The merger consideration will consist of $48.75 in cash and 0.2434 shares of stock of the combined company per ESRX share. Upon closing the transaction, Cigna shareholders will own approximately 64% of the company and Express Scripts shareholders will own 36%. Current CEO of Cigna, David Cordani, will lead the combined company with Tim Wentworth, current CEO of Express Scripts, transitioning to President of Express Scripts, Inc. The deal is being closely watched and scrutinized by the Department of Justice who recently asked both companies for additional information. The Justice Department successfully blocked both Aetna from buying Humana Inc. and Anthem Inc. from acquiring Cigna in 2017, but Cigna is still confident in their ability to gain regulatory approval and complete the acquisition by the end of 2018. Negative headlines when detached from strong fundamentals create opportunities. Companies like FedEx and UPS recently hit attractive levels due to fears over global trade wars. Google and Facebook have suffered sharp declines due to the mishandling of personal data by Facebook and uncertainty over tightening regulation. However, both have strong underlying demand trends and powerful platforms driven by predictive data analytics, artificial intelligence and a network effect. As a group, industry leading biotechs have been trading at a very cheap 12 times 2018 earnings vs. 17 times for the S&P. Exciting research breakthroughs are leading to major advances against many diseases. Quality medtech firms like Medtronic and Zimmer trade at very reasonable valuations versus free cash flow. A good buy results when a powerful franchise suffers under horrible emotional headlines. Like John Train, author of The Money Masters has said, “The safe time to invest is when investors are discouraged and desperate.” An example is our purchase of Visa and Mastercard. Back in 2010 they were under a cloud of negative headlines regarding interchange fees. The fundamental digital trends were strong. Our cost basis in Mastercard is $22 and it recently traded above $174. Our Visa basis is $16, and it recently hit $125. It can be so expensive to get caught up in news headlines and the emotion of markets if it detracts from focusing on facts underlying operating reality. As financier and Presidential advisor Bernard Baruch used to say, “Facts are facts even in the height of emotion.” Strong sales, earnings and cash flows together with diligent managerial capital allocation will drive intrinsic value and ultimately stock returns. Consumer staples like beverages have been declining in 2018 but we see private equity stepping in if prices remain weak as those businesses are enduring, generate attractive free cash and are better able to handle increased leverage. Nearly a quarter of the S&P is weighted in technology stocks with a trailing price earnings of 33. Huge capital investments (over $90 billion) are entering the industry via the likes of Softbank, a Japanese conglomerate dedicated to technology investment. Back in 2000, Softbank dropped over 90% due to enthusiastic purchases of inflated technology stocks. We are watching the IPO markets for even further supply. The cloud is so popular that it is attracting enormous capital spending, just like fiber optic in the late 1990s and more recently the farm sector and natural gas. Exuberance over exciting growth prospects can often lead to a flood of entrants and capital, leading to overinvestment and supply gluts. We continue to see increasing volatility with headline risk. However, overall the fundamentals for US earnings look the best since 2011. The supply of public stocks is still down over 50% since 1998. Private equity has over $1 trillion in buying power. Companies in the S&P 500 could retire an additional $800 billion in stock this year via buybacks. In the first quarter corporate mergers and acquisitions are up 60%. The rule of law in the US is stronger this past year compared to Venezuela which has no rule of law and suffers annual inflation over 10,000%. After the Reagan tax cuts in 1986, I remember a period where earnings were so strong the market survived a three percent rise in long term interest rates before correcting in a major way in 1987. The S&P 500 Index is a broad-based, unmanaged measurement of changes in stock market conditions based on 500 widely held common stocks. The Barclays US Aggregate Bond Index is a broad-based benchmark that measures the investment grade, US dollar-denominated, fixed-rate taxable bond market. FTSE 100 Index, also called The Financial Times Stock Exchange 100 Index, FTSE 100 Index, FTSE 100, FTSE, or, informally, the “Footsie” /ˈfʊtsi/, is a share index of the 100 companies listed on the London Stock Exchange with the highest market capitalization. The STOXX Europe 600 Index is derived from the STOXX Europe Total Market Index (TMI) and is a subset of the STOXX Global 1800 Index. With a fixed number of 600 components, the STOXX Europe 600 Index represents large, mid and small capitalization companies across 17 countries of the European region: Austria, Belgium, Czech Republic, Denmark, Finland, France, Germany, Ireland, Italy, Luxembourg, the Netherlands, Norway, Portugal, Spain, Sweden, Switzerland and the United Kingdom. One cannot invest directly in an index or average. Major tax legislation signed into law in December of 2017, the Tax Cuts and Jobs Act, has been a powerful positive for US companies. This together with meaningful reforms in onerous regulations has energized and created attractive incentives to start new businesses. Earnings growth in 2018 for the S&P 500 Index could exceed 16% after a similar gain in 2017 (Standard & Poor’s). I remember investing after the 1986 Reagan tax cuts and witnessing strong new business formations, which were very stimulative. Corporate earnings accelerated even with a dramatic increase in interest rates. 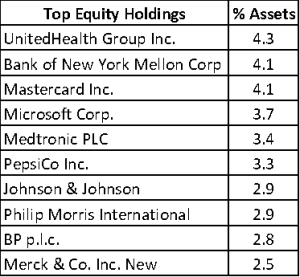 Partly due to a rollback in regulation, American Banker estimates that the top ten banks in America now have enough excess capital to retire one-third of their outstanding shares. A drop in corporate rates from 35% to 21% together with repatriation of foreign earnings could add further to stock buybacks, dividend increases and mergers. 100% expensing of depreciable property should enhance capital spending and could add up to half a percent to GDP growth. Many foreign manufacturers are locating to the US due to the lower tax burden and low natural gas prices. Private equity buying power adds another $1 trillion in demand (Fortune) just as public stock in the US has dropped by over 50% since 1997 (Economist). We watch the initial public offering (“IPO”) market closely for signs of oversupply. While both the Reagan tax cuts in 1986 and the Kennedy tax cuts (Revenue Act of 1964) added firepower to the economy they also contributed to higher interest rates, hurting holders of bonds. Today, the tax stimulus combined with a low 4.1% unemployment rate could lead to much higher interest rates. Companies with poor balance sheets or those dependent on debt funding like real estate investment trusts (“REITs”) and utilities suffered in the past. We have learned it is critically important to study the tax code as the changes in 1986 really hurt commercial real estate, ultimately contributing to the thrift crisis. This time ultra-high-end housing along with municipal bonds look vulnerable. Globally, a movement toward free market solutions and efforts to clean up corruption contributed to huge moves in cheaper emerging markets. Argentina was the number one performing market in the world for 2017, returning over 76%, as represented by the Merval Index, due largely to free market reforms. Brazil has targeted corruption while privatizing many industries. China continues to add to market solutions as well. The internet is creating greater financial transparency, exposing and cleaning up bad behavior. Companies that are executing and have proven platforms are enjoying almost monopolistic market power. As an investor, it is so important to tune out crazy news headlines and relentlessly focus on facts and fundamentals pertaining to company cash flows, revenues and execution. We have learned over many years the importance of exceptional management, integrity and private property rights. Companies that are operationally efficient with a network effect on the right side of digitization can enjoy enormous pre¬mium valuations. While fear is the friend of the fundamentalist, euphoria is the enemy of the diligent capital allocator. Recently, bullish sentiment has reached extremes which can often portend a short-term correction. Bad loans and most mergers are made in good times, often at bad prices that fail to compensate for the risk taken. The average age for first time home buyers is 31. According to the Wall Street Journal, home ownership hit a 50-year low in 2016, at 62.9%. In 2017, the rate increased for the first time in 13 years. While fundamentals look good for low-end housing, the high-end has been hit hard by the limits to the deductibility of interest and property taxes. The millennials now outnumber baby boomers. where the S&P 500 earnings growth was the fastest, P/Es contracted. Sky high valuations can torpedo a portfolio if price-earnings ratios compress. I can remember buying food stocks at a bargain six times earnings in the 1980s after high inflation in the 1970s. The president has deep experience in construction in New York City. He was skilled in fighting the permit process. Look for the streamlining of permitting for roads, bridges, water systems, waterways, etc. With manufacturing unemployment running under 2.5%, healthy wage growth should follow. 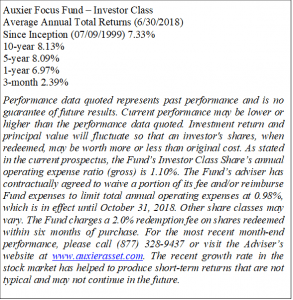 Auxier Focus Fund’s Investor Class returned 5.67% in fourth quarter vs. 6.64% for the S&P 500 Index. For the year ended 12/31/2017 the Fund returned 17.71% vs. 21.83%. The stocks in the Fund returned 6.24% for the quarter and 20.35% for the year. Domestic stocks comprised 79% and foreign 15%, with cash and “workouts” 6%. Since inception at the top of the market in 1999, a hypothetical $10,000 investment in the Fund has grown to $38,410, with an average equity exposure of 78% compared to $27,158 for the fully invested S&P 500. After a rough start to the year, Kroger delivered a net earnings increase of 1.5% vs. an earnings decline of 56% year over year. This improvement was driven by their record-setting Black Friday results for general merchandise and record sales at Fred Meyer. Digital revenue was up 109% from the continued positive response to Kroger’s online-grocery ordering service. Recently the company has been in discussions with Chinese online powerhouse­ Alibaba. We have been very impressed with Kroger’s use of data analytics. With a nationwide shortage of both trucks and drivers, shipping costs are up over 18% this past year. This will pressure margins for the online delivery model. Companies like Kroger with a vast store base should have an advantage. Additionally, 2017 saw some of the biggest price declines in food since 1950. Recently those price fundamentals show signs of improving. UnitedHealth’s data and technology platform, Optum, had another quarter and now full year of double-digit percentage earnings growth in all of its segments. Due to positive results, UnitedHealth raised their 2018 adjusted earnings guidance by 16% at the midpoint to $12.45 per share. CEO David Wichmann expects Corporate Tax Reform to boost earnings and cash flows by $1.7B in 2018. In 2012 the company’s cloud revenue totaled $700 million. Today, Microsoft has quarterly cloud revenues exceeding $5 billion with 55% margins. Driven by Azure’s revenue growth of 90%, revenue in Microsoft’s Intelligent Cloud segment increased 14% to $6.9B with commercial cloud annual recurring revenue exceeding $20B. Total revenue grew 12% as their Productivity and Business Processes and Intelligent Cloud segments made up for the stalling Personal Computing. Loan and deposit growth of 3.3% and 3.8% along with higher interest rates led to net interest income growth of 11% to $11.5B in the quarter. After a $2.9B charge related to the Tax Cuts and Jobs Act, Bank of America plans to benefit from more rational regulation and lower tax rates. Anthem’s three reportable segments all had operating revenue growth in the most recent quarter while cutting total expenses by 5%. After ongoing accusations of Express Scripts overcharging by billions of dollars, Anthem announced its plan to set up its own pharmacy benefits management unit called IngenioRx and secured a five-year agreement with CVS Health Corp. that will go into effect at the end of 2019. PepsiCo saw overall organic revenue growth of 1.7% despite its North American Beverages sector revenues decline for the first time in two years. Latin America and ESSA had operating profit growth of 14% and 12% respectively to pick up the slack. By 2025, PepsiCo plans to have at least two-thirds of their beverages contain 100 calories or less per serving. PepsiCo continues to expect $7B in free cash flow for the full fiscal year. Express Scripts recently acquired eviCore Healthcare, an industry leader in evidence-based medical benefit management services. EviCore helps manage medical benefits for 100 million people, and Express Scripts expects the acquisition to be accretive to adjusted diluted earnings per share in 2018, which they now estimate in the range of $7.67 to $7.87. At a P/E of 12 times 2018 the stock seems very cheap. Johnson & Johnson saw a 10.3% growth in net sales as their Pharmaceutical segment–which represents 49% of overall sales–jumped 15% in the quarter. This has been due in part to the consistently growing sales of their lymphoma treatment, Imbruvica, increasing 46.7% year over year as additional implications continue to be approved by the FDA. Mastercard had a record-setting quarter, increasing revenues by 18% and growing net income by 21% to $1.4B. This year, Mastercard will be Costco’s exclusive co-brand partner in Japan as they continue to focus on international growth opportunities. On the innovation front, Mastercard continues to push forward providing payment options on smartphones, workspace connected communities, and virtual reality. They have recently landed large retailers Kroger and Cabela’s. BP had a productive quarter as group oil and gas production averaged 3.6M barrels of oil equivalent a day, a 14% increase over last year, while downstream underlying quarterly earnings were the highest in five years growing almost 67%. All seven of the major projects they expected to start this year are online, including starting production in three major upstream projects in Australia, Trinidad, and Oman. BP re-entered the solar power market with the purchase of a 43% stake in Lightsource Renewable Energy Ltd. for $200M. Aggressive cost cutting is finally paying off as oil prices have improved by over 25% in four months. Walmart’s continued effort to strengthen their online offerings to compete with Amazon is gaining more traction as eCommerce sales grew 50% in the quarter. As a result, 63 Sam’s Clubs are slated to close and approximately 12 will be converted to online fulfillment centers while scaling back Walmart brick-and-mortar growth in the US. Corning is edging their way into the medical field with Valor Glass. Working with Merck and Pfizer, Corning is developing a damage-resistant glass for vials that will reduce flaking, contamination, and breaking while being more efficient to manufacture. Corning’s Gorilla Glass continues to be a big seller as Apple, Samsung, and other phone manufacturers use it on ­their flagship devices. Specialty Materials net earnings were up 71% over last year helping the decline of LCD screen prices in Display Technologies. The Travelers Co. had record-setting net written premiu­ms of $6.6B and growth in all segments as retention remained at historic highs in Commercial Businesses. Hurricane Harvey, Irma, and Maria are estimated to have damages exceeding $250B causing Travelers’ net income to be impacted by $455M of catastrophe losses. The pricing for many property and casualty products is showing signs of firming going into 2018. LyondellBasell was able to deliver double digit revenue and earnings growth despite Hurricane Harvey affecting each of their major US Gulf Coast sites. Even after the impact of increasing feedstock prices and production outages, they were able to produce 13% more ethylene across their global system compared to the previous year. LyondellBasell also plans to build the world’s largest propylene oxide and tertiary butyl alcohol plant in Houston in the second half of 2018. Merck & Co. had a challenging quarter as total sales declined 2% due to a temporary production shutdown from a cyber-attack. Merck’s Pharmaceutical segment–making up 89% of sales–fell 3% as they lost market exclusivity for two of their top cholesterol treatments and are facing increasing pricing pressure on their top-selling drug. On a positive note, the outlook for cancer-fighting immunotherapy Keytruda is very encouraging. Philip Morris’s reduced risk, heated tobacco product IQOS accounted for 40% of shipments to Japan in the quarter, surpassing combustible cigarettes for the first time in that market. Although it has seen impressive growth in the Japanese market, it is still waiting for FDA approval in the US. We believe it will be approved. Turnover headwinds from a stronger euro and overall weak market demand led to a challenging quarter for Unilever. Underlying sales growth of 2.6% was driven by their emerging markets’ 6.3% growth while developed markets declined 2.3% in the quarter. Although revenues were up 8%, they came in below analysts’ expectations. Bookings were down 22.5% year over year due to several large contracts being delayed, causing it to come in below the company’s guidance. However, it could lead to all-time high levels of bookings once these deals are signed. Natural disasters in Mexico and Puerto Rico along with a costly Colombian arbitration panel ruling led to a net loss of 9.5B pesos vs. a net income of 2.1B pesos year over year. America Movil is working on rolling out a 4.5G network which is expected to be 7x faster than 4G in parts of Mexico, and gearing up for 5G by 2020. After a year of catastrophic events leading to aggregate pre-tax catastrophe losses of $3.0B in the quarter, American International Group’s CEO is looking forward to 2018 as “The Year of the Underwriter.” AIG will be focusing on commercial underwriting, enhancing underwriter tools, and their talent base to position themselves for long-term growth. With over $130B in insured losses for 2017, the industry pricing environment is firming on projected 2018 renewals. In the past, we have enjoyed solid returns with the new AIG CEO Brian Duperreault when he successfully turned around a troubled Marsh & ­­McLennan. Oracle’s cloud revenue growth of 44% drove performance for the quarter. They will soon deliver the Oracle Autonomous Database in the Oracle Cloud claiming it to be 10x faster at less than half the cost of running a database in the Amazon Cloud. The fully-autonomous database will not require any human labor for administration, will detect security vulnerabilities and patch itself immediately while running, and will reduce planned and unplanned downtime to less than thirty minutes per year. Policies out of Washington DC this past year have reduced taxes and regulations while reinforcing property rights and the rule of law. This has enhanced business fundamentals and encouraged risk taking. Global economies have been improving as well. On the downside, we are now seeing signs of increased digital speculation in the form of cryptocurrencies, pre-public technology companies and extreme readings of bullish sentiment. In times of easy money, price momentum can overtake fundamental cash flow analysis. We are long overdue for a correction which is both needed and healthy. Over the past century the general US stock market has averaged a 10% correction about every 18 months. This year the New England Patriots played their eighth Super Bowl with Tom Brady and Bill Belichick at the helm. This dynasty will go down as the best of all time. Yes, they tend to outwork their opponents, but their true advantage may be the fierce discipline in adhering to their proven strategy. In the new documentary “Tom vs Time” Brady explains his mindset for getting ready for the Super Bowl, saying, “You have to put all the noise and hype aside and focus on what you have to do.” In a time where there are so many distracting headlines and speculations, we see the need to zero in on implementing a proven enduring investment approach to the markets by drilling down daily on the fundamental drivers of intrinsic value. The S&P 500 Index is a broad-based, unmanaged measurement of changes in stock market conditions based on 500 widely held common stocks. The MERVAL Index (MERcado de VALores, literally Stock Market) is the most important index of the Buenos Aires Stock Exchange. It is a price-weighted index, calculated as the market value of a portfolio of stocks selected based on their market share, number of transactions and quotation price. One cannot invest directly in an index or average.